This appendix introduces and briefly describes how to use InterSystems IRIS™ support for the WS-Management specification, which enables you to remotely monitor an InterSystems IRIS instance via SOAP. Following the WS-Management specification, the SYS.WSMon package provides a web service that you can use to remotely monitor an InterSystems IRIS instance. It is functionally similar to the SNMP interface (see the “Monitoring InterSystems IRIS Using SNMP” appendix of this guide), but uses the built-in InterSystems IRIS web service services support. The Log Monitoring Web Service (SYS.WSMon.Service) that provides methods that return information about an InterSystems IRIS instance. An InterSystems IRIS web service client (SYS.WSMon.Client) that can invoke methods in this Monitoring Web Service or in the Monitoring Web Service of another InterSystems IRIS instance. For information on working with %XML.DataSet, see the chapter “Using Datasets in SOAP Messages” in Creating Web Services and Web Clients or see the class reference for %XML.DataSet. Subscribes the given web service to receive information about events in this InterSystems IRIS instance. This can be your own web service or can be the SYS.WSMon.EventSink web service, which is provided as an example. If you create your own web service, it must follow the WSDL of the SYS.WSMon.EventSink web service. Where server is the server on which InterSystems IRIS is running, and port is the port that InterSystems IRIS uses. For each event, InterSystems IRIS will attempt to call EventSink() method of the given web service, sending an instance of SYS.WSMon.wsEvent. Returns an instance of SYS.WSMon.wsSystem that contains system information about the InterSystems IRIS instance. The SYS.WSMon.Client class and related classes are an InterSystems IRIS web service client that can invoke methods of SYS.WSMon.Server web service in the same InterSystems IRIS instance or another InterSystems IRIS instance. Where server is the server on which InterSystems IRIS is running and port is the port that the InterSystems IRIS web service server uses. This is necessary if the SYS.WSMon.Server web service that you want to use is on a different machine than the client, or if it uses a port other than 52773. See Creating Web Services and Web Clients. The details depend on the web method you invoke; see the section “Web Methods of the Monitoring Web Service” and see the class reference for the return types. 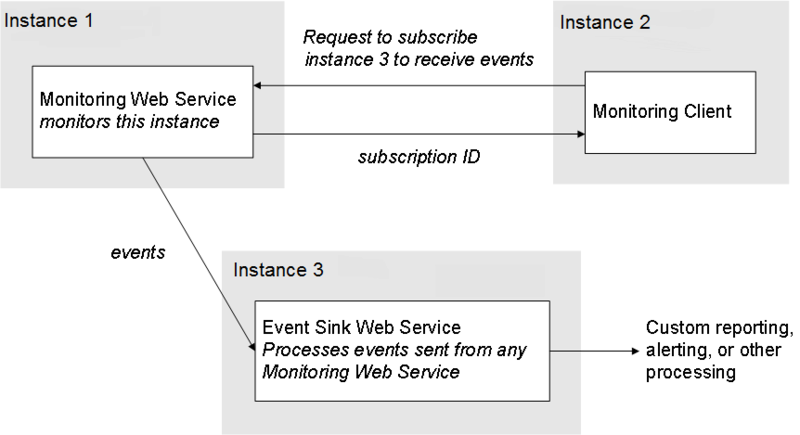 InterSystems IRIS provides a sample web service (SYS.WSMon.EventSink) that can receive and process events sent by any Log Monitoring Web Service. You can use this web service or create and use your own. SYS.WSMon.EventSink is a sample InterSystems IRIS web service service that can receive and process events. For details on using this wizard, see Creating Web Services and Web Clients.